Playing bowls on a lush lawn is a quintessentially English way to spend a summer’s afternoon. Indeed, as any schoolboy or girl will testify, bowls has claimed a place at the heart of the nation’s history with the story of Sir Francis Drake and the Spanish Armada, and the seafarer’s insistence on finishing his game before taking on the invading fleet. Academics have long debated the historical accuracy of Drake’s sporting fervour but there is no doubting its appeal to the romantics. What is not in doubt is the appeal of bowls as a gentle game. It must rank as one of the safest sports in the world, save for the occasional twinge that older players may experience when bending forward to release a bowl. It must also rank as one of the most inclusive because it can be enjoyed by players of all age groups, requiring little of the physicality that shifts the advantage very heavily in favour of younger players in other sports. Therefore, it is ideal for a spot of family bonding, pitting grandparent against grandson, father against daughter. In terms of equipment, it is a relatively inexpensive sport to play. The focal point of the game, a small ball, or bowl, known as a Jack is required. In addition, each player requires two or four larger bowls and a mat. While some people prefer to purchase their own bowls, the good news is that many municipal clubs hire out sets at a relatively inexpensive rate. In the United Kingdom, both casual and competitive games are played in indoor arenas, but the sport comes into its own outdoors, in one of two forms: lawn bowls and crown green. As the names suggest, the former involves a flat surface, while in the latter the lawn slopes upwards from the edge to the centre, to form a “crown”. 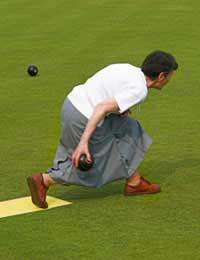 Lawn bowls is played up and down the pitch, while in crown green any direction up, down or across can be chosen. The game begins by rolling the Jack, the object then being for each player to attempt to roll each of his bowls as near to the Jack as possible. At the culmination of each “end”, measurements are taken and the bowl nearest the Jack is declared the winner and awarded a point. If the player nearest the Jack has additional bowls closer than any of his opponent’s, additional points are awarded. The game is won when a player reaches a designated number of points or has amassed the greater number of points after a designated number of “ends”. The level of skill in bowls is raised by means of each bowl possessing a “bias” i.e. one side that is flatter than the other. This means that rather than rolling straight, a bowl will turn in or out of its original path depending on the influence of the bias. When coupled with the skill of “reading” the green, in other words the dips and bumps as well as the speed of the surface, it makes bowling a lot more difficult than simply rolling a ball in a straight line. Mind you, with no sign of another invasion fleet on the horizon, you’ll have plenty of time to sharpen your technique.